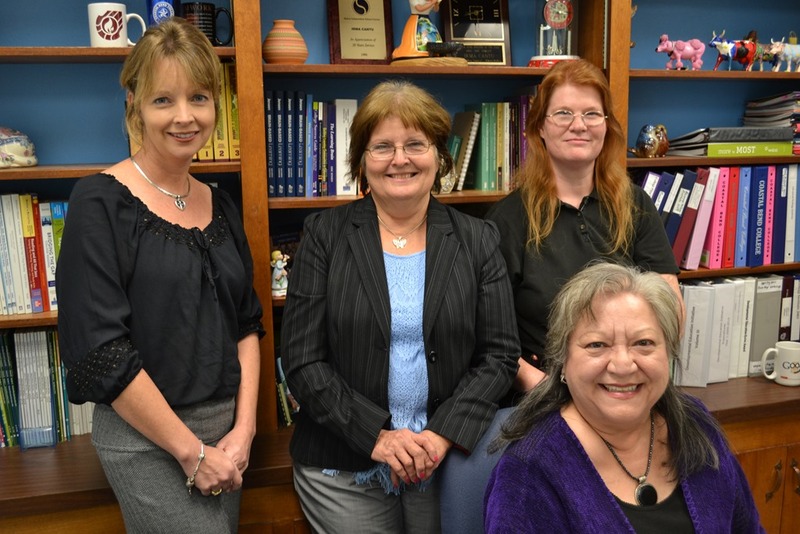 Pictured left to right: Kristi Schroeder, Bobbie Jo Hill, Paula Kenney-Wallace, Seated: Irma Cantu, Division Chair; Not Pictured: Elsa Brown, Cheon-Sig Lee, George Kucera, Dave Zimmerman, and Christi Morgan. Coastal Bend College has been recertified as a Leader College by Achieving The Dream (ATD). This is a nationwide initiative begun by the Lumina Foundation, a 1.7 billion dollar foundation focused on supporting effective practices in higher education. Achieving the Dream works to support community colleges in their work to improve student completion on a national level and leads the nation’s most comprehensive, non-governmental reform network for community college student success and completion. The group and its 200 member community college network have successfully impacted student engagement and graduation for over 3.5 million of the nation’s community college students. In 2009 Coastal Bend College was one of 13 colleges across the country to be recognized as a Leader College for AtD. Leader Colleges are evaluated on whether or not they have met high standards of practice and performance. Data collection and reporting is extensive and colleges must have demonstrated a commitment to and progress on the four principles of Achieving the Dream: committed leadership, use of evidence to improve programs and services, broad engagement, and systemic institutional improvement. Leader Colleges will serve as mentors within the Achieving the Dream community of learners as well as advocates for the principles of Achieving the Dream. Coastal Bend College was recently recertified as a Leader College on the basis of two measures of dedicated interventions to help students succeed. First, students required to take the developmental math courses were supported through successful completion. Irma Cantu, chair of CBC’s College Preparatory Studies department says, “Our first student success measure was for Developmental Education Math students to successfully complete developmental instruction so that they could move on to college credit courses. We were able to detail the successful completion of the developmental instruction sequence over four years. Because our institutional data trends with national data showing that math courses are often barriers to achievement, we settled our focus there. Second, these same students fared very well when they advanced to the “gatekeeper” math courses, which have traditionally been the courses that keep students from attaining a degree, such as the first college level math course. Slightly more than half (51%)of the students taking Developmental Math and enrolling in college algebra at CBC were successful in the 2008-09 academic year, which is the baseline for this student success measure. The success rate for all gatekeeper math course students increased steadily over the next few years, resulting in an overall successful course completion rate of 82% for the students who had participated in the Developmental Math Initiative. More impressive is that the Developmental students attained a higher rate of successful completion in the gatekeeper math course than students who did not need developmental math. Anyone wishing to find out more about Achieving the Dream and Coastal Bend College’s College Preparatory Studies departmental initiatives are encouraged to contact Susan Smedley, Director of Marketing and Public Relations for CBC at (361) 354-2399 or smedleys@coastalbend.edu.